Route 122 Improvements Part of Upcoming SamTrans Service Changes – Peninsula Moves! Starting next week, passengers travelling on SamTrans Route 122 will have a little extra time to shop around and hang out in San Francisco, thanks to new service improvements set to take place. Every four months, SamTrans adjusts its scheduling and service operations to take into account changing traffic impacts, travel patterns and bus operator availability. The adjustments help SamTrans improve on-time performance standards and make the bus system run more efficiently and reliable. 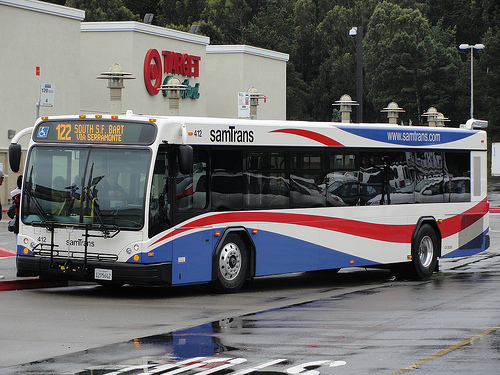 As part of the next round of changes, which are slated for August 9, SamTrans will increase service on its popular Route 122, a bus line that travels between the Stonestown Galleria shopping mall in San Francisco to the South San Francisco BART Station. To give riders on the line more options, SamTrans is increasing evening service and adding more trips to Route 122. On weekends, SamTrans will add six evening trips on Route 122 buses leaving the Stonestown mall. Those buses will all depart after 7:26 p.m. In the opposite direction, nine northbound trips will be added for passengers travelling from the South San Francisco BART Station, with all those buses leaving after 6:04 p.m.
During the weekday, four northbound trips on Route 122—at 6:02 p.m., 6:32 p.m., 8 p.m. and 9 p.m.—will leave the South San Francisco BART Station. Those trips are about 10 minutes later than currently scheduled. Additionally, four brand new trips will depart from the South City BART Station, leaving at 7:40 p.m., 8:40 p.m., 9:40 p.m. and 10:10 p.m. Along with the increased northbound buses, SamTrans will be adjusting to its southbound service as well. Eight southbound trips—ranging between 5:14 p.m. and 8:39 p.m.—will be tweaked slightly to meet passenger needs. They will leave from Stonestown Mall on average four minutes earlier than currently scheduled. Trips normally set to leave between 9:19 p.m. and 10:19 p.m. will leave nine minutes earlier. The service upgrades to the Route 122—aimed at giving passengers more mobility options—are among the highlights of the upcoming scheduling changes slate for August 9. A detailed breakdown of the service and scheduling adjustments set to happen on each line can be found here.